Dr. William W-G. Yeh (University of California, Los Angeles). The prize is awarded to Dr. Yeh for his development of optimization models to plan, manage and operate large-scale water resources systems throughout the world. His methodology utilizing systems analysis techniques — as well as the algorithms he developed for the real-time operation of complex, multiple-purpose, multiple-reservoir systems — have been adopted in the United States and throughout the globe, most notably in Brazil, Korea, Taiwan and the People's Republic of China. 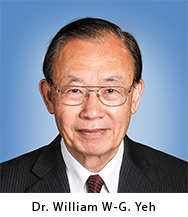 Dr. Yeh’s many achievements include the development of the operation rules and optimization of California’s reservoir and water distribution systems; the water distribution system model and optimization for water supply for the city of Sao Paulo, Brazil; and the management and operation of large‐scale hydropower systems, such as the Brazilian hydropower system and the Three Gorges Project in China. His work represents the practical and novel application of new methods to deal with many different and difficult aspects of water management under a wide and diverse range of situations. 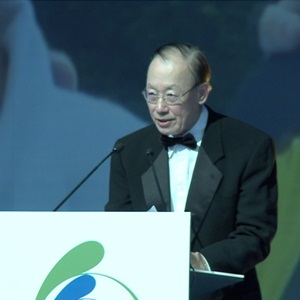 Dr William W-G. Yeh is is Richard G. Newman AECOM Distinguished Professor of Civil Engineering, Civil and Environmental Engineering Department, University of California, Los Angeles. • Ph.D. 1967; Stanford University, Civil Engineering. • M.S. 1964; New Mexico State University, Civil Engineering. • B.Sc. 1961; National Chen-Kung University, Taiwan, Civil Engineering. 2012: Lifetime Achievement Award, Environmental & Water Resources Institute, (ASCE). 2008: Distinguished Alumnus Award, National Cheng Kung University, Taiwan. 2003: Outstanding Alumni Award, National Chen-Kung University North American Alumni Foundation. 1996: Centennial Distinguished Alum, New Mexico State University. 1994: ASCE Water Resources Planning and Management Division's Outstanding Journal Paper Award for paper (with Becker, Hua, Wen and Liu), "Optimization of Real Time Hydrothermal Operation." 1994: American Society of Civil Engineers' Julian Hinds Award for "many contributions to research and teaching in water resources planning and management and to water resources engineering practice, particularly in the areas of hydrological and hydrodynamic modeling and optimization of large-scale water resources systems." 1989: American Geophysical Union's Robert E. Horton Award for "distinguished contributions and leadership in water resources systems, hydrologic modeling, and particularly groundwater hydrology." 1981: Engineering Foundation Fellowship Award on behalf of ASCE for the state-of-the-art review, "Theories and Applications of Systems Analysis Techniques to the Optimal Management and Operation of a Reservoir System." 1975: UCLA Engineering Alumni Association Distinguished Faculty Award for excellence in teaching. Your Royal Highness, Excellencies, colleagues and friends, ladies and gentlemen. The Prince Sultan Bin Abdulaziz International Prize for Water is a distinctive award recognized and respected around the world. To be selected for the award is truly an honor, and I am very much humbled to be here to receive the Prize in the Kingdom of Saudi Arabia and in the presence of Your Highness. I would like to take this opportunity to pay my respect to Your Royal Highness and the country of Saudi Arabia for your foresight and commitment to environmental protection. The prize recognizes contributions to the sustainable availability of potable water. Additionally, the prize brings attention to the importance of water resources and the escalating global problem of water scarcity. I live in Southern California, which is a semi-arid region in the United States of America. The water supply to the region derives from imported water from Northern California via the California aqueduct, imported water from the Colorado River to the east via the Colorado River aqueduct, regional storage and transfer, and conjunctive use of surface water and groundwater. Southern California’s strong economy is a direct consequence of adequate water supply to the region. The semi-arid climate of California’s central valley region has been transformed into rich productive farmland as a result of the construction of the California Central Valley Project (CVP). CVP consists of a series of reservoirs, aqueducts and pumping stations. It provides irrigation and municipal water to much of California’s central valley by regulating reservoirs in the water-rich northern part of California and transporting water to the semi-arid central valley. In the early 1970s, I was fortunate to have had the opportunity to work on the development of optimization models for the real-time operation of the CVP. At that time, most of the CVP facilities had been built and water and power contracts signed, but no one really knew how to operate the system. This was primarily because of the size and complexity of the project. There was an urgent need to develop models that could assist in decision making. I had the good fortune to work with two very competent practicing civil engineers, Larry Hancock and Dan Fults of the U.S. Bureau of Reclamation. Their experience and expertise in water resources management from a practical perspective helped me understand and appreciate the difficulty of putting theory into practice. With financial support provided by the Bureau of Reclamation and assistance from two of my former PhD Students, Leonard Becker and Wen-Sen Chu, we developed a series of monthly, daily, and hourly models. The overall methodology sought to optimize, in turn, a monthly model over a period of one year, a daily model over a period of one month, and an hourly model over a period of one day. Outputs from one model were used as inputs to the next echelon model, iterating and updating whenever new information on inflow prediction and system state became available. This methodology as well as the algorithms we developed for the real-time operation of complex, multiple purpose, multiple reservoir systems have been adopted throughout the world, most notably in Brazil, Korea, Taiwan, and the People's Republic of China. Sponsored by a U.S.-China scientific collaboration program (1987-1990), the late Professor Shi-Qian Hua of the Nanjing Research Institute of Hydrology and I developed an economic optimization model for real-time operation of a hydrothermal system in the People’s Republic of China. More recently, in collaboration with a research team at Tsinghua University, we developed a methodology for optimizing the hydro unit commitment for the Three Gorges Project (TGP) in China. The TGP is the world’s largest and most complex hydropower system in operation, with an installed capacity of 22,500 megawatts. Over the last 30 years, in collaboration with Professors Ben Braga, Mario Barros and Renato Zambon at the University of São Paulo, Brazil, we developed several models for water resources management in Brazil, including a model for the optimal operation of the Brazilian hydropower system that consists of more than 75 reservoirs. With the rapid advancement in computing power and the availability of user-friendly interfaces, such optimization models have been adopted for water management and protection in various regions of the world. A small improvement in the operation of large-scale water resources systems translates into enormous water savings and other benefits over time. There have been so many people who generously have given their time and insight along the way that I cannot begin to thank them all tonight. In addition to the people already mentioned, I would like to acknowledge a few others. At Stanford University my PhD advisor, Professor Joseph Franzini, served as a mentor to me. He patiently shared his knowledge, experience and time, but also challenged me to work independently to achieve results. When I first started as a young Assistant Professor at the University of California at Los Angeles, the late Professor Warren Hall encouraged and motivated me through his example. He introduced me to the field of Systems Analysis, and inspired me to achieve more than I thought I could. I am particularly grateful to my nearly 60 PhD. students for working together and exchanging ideas. I hope they have learned from me, and I know I have become a better scholar and person because of them. Of course I am most indebted to those who are closest to me – my wife Jennie and my two sons Michael and Bobby. Without their unconditional love and support I certainly would not have achieved professional success and thus would not be speaking to you today. It is with both pride and humility that I accept this distinguished award. 1. Barros, M.T. L., Zambon, R.C., Barbosa, P.S.F., Yeh, W. W-G., “Planning and Operation of Large-Scale Water Distribution Systems with Preemptive Priorities,” Journal of Water Resources Planning and Management, ASCE, 134(3): 247-256, May 2008. 2. Cheng, W-C., Hsu, N-S., Cheng, W-M., Yeh, W. W-G., “A Flow Path Model for Regional Water Distribution Optimization,” Water Resources Research, 45, W09411, doi:10.1029WR007826, 2009. 3. Chiu, Y-C., Nishikawa, T., Yeh, W. W-G., An Optimal Pump and Recharge Management Model for Nitrate Removal in the Warren Ground-water Basin, California,” Journal of Water Resources Planning and Management, ASCE, 136(3): 299-308, May/June 2010. 4. Zambon, R.C., Barros, M.T.L., Lopes, J.E.G., Barbosa, P.S.F., Francato, A.L., Yeh, W. WG. “Optimization of Large-Scale Hydrothermal System Operation,” Journal of Water Resources Planning and Management, ASCE, 138(2): 135-143, March/April 2012. 5. Li, X., Li, T., Wei, J., Wang, G., and Yeh, W.W.-G., “Hydro Unit Commitment via Mixed Integer Linear Programming: A Case Study of the Three Gorges Project, China,” IEEE Trans. Power Syst., 2013, doi: 10.1109/TPWRS.2013.2288933.